When you feel the pull of the outdoors, don’t overlook the obvious choice: Georgia’s 63 state parks and historic sites cover incredibly diverse terrain, from North America’s largest blackwater swamp to one of the world’s great mountain ranges. Accommodations can be as rugged as you want (or perhaps plusher than you expected), and even at the busiest park, you’re sure to find some lovely, leafy trail removed from humanity. Here are a few of our favorite places to explore, especially when the leaves start to turn. In 1933, 200 members of FDR’s Civilian Conservation Corps (CCC) descended on the burned-out, clear-cut peaks of North Georgia near Blairsville. The men of Company 431 planted some 50,000 trees and dug an earthen dam across Wolf Creek, repurposing rocks to erect the facilities of Vogel State Park. 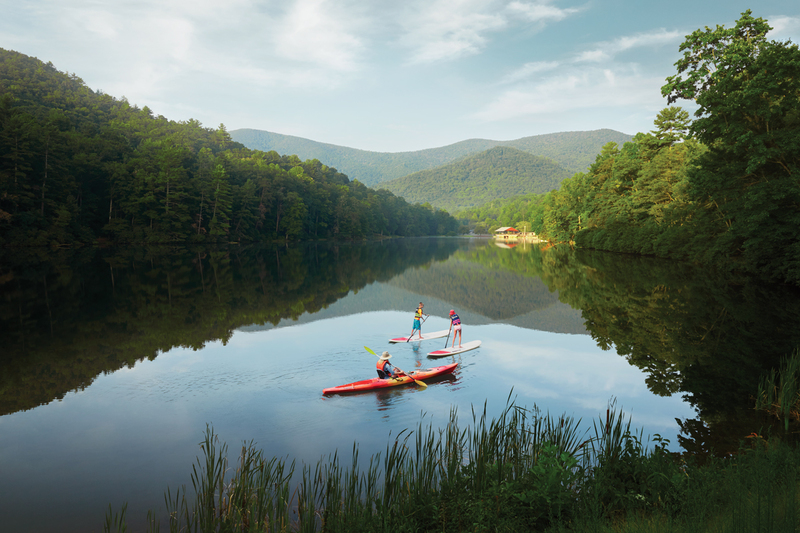 Generations of families have enjoyed the resulting Lake Trahlyta, named after a Cherokee princess and set against the backdrop of Blood and Slaughter mountains, the site of a deadly battle between the Creek and Cherokee. 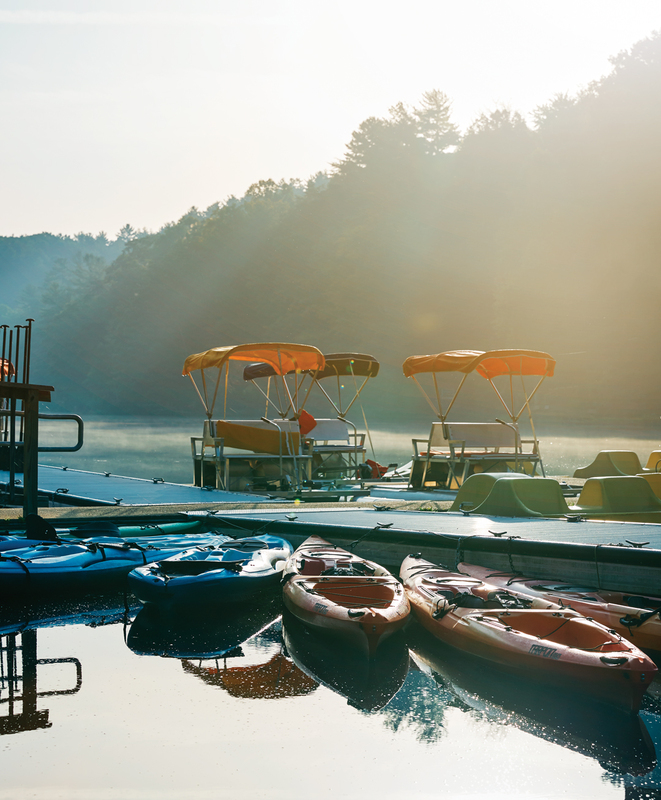 With 35 cottages, the most of any Georgia state park, Vogel has a sleepaway-camp vibe. On a recent holiday weekend, several porches were draped in bunting and lights. Paddleboats and paddleboards dotted the lake while children splashed inside the buoys or roamed on bikes around the visitor center and putt-putt course. It’s also easy to escape into the quiet woods. Vogel boasts a diverse mix of hiking trails, including a popular four-mile trek and a 13-mile backcountry loop. New this year, a 1.25-mile (one way) trail takes you to the Byron Herbert Reece Farm and Heritage Center. Reece, a now-deceased Guggenheim Fellowship–winning poet, was born on the property now covered by Lake Trahlyta. The restored farmstead houses old-fashioned agricultural equipment, a garden trail, and personal artifacts. Saddled with a preschooler and toddler, my family chose the two shortest hikes. The mile-long lake loop passes through mountain laurel leaning over the water, by a spur to a hidden waterfall, and provides a postcard-perfect mountain view. The loop takes you past six New Deal–era stone-and-log cabins. Five are open to guests and renovated with surprising Joanna Gaines–worthy flair, including historic CCC photographs. (For more archival images, visit the park’s compact museum, which also displays construction tools and uniforms.) Each cabin features one bedroom and a pullout couch. The park also offers newer, simpler cottages, including two-bedrooms, plus more than 100 campsites that sprawl into the surrounding woods. We ducked into these woods to walk the Byron Herbert Reece Nature Trail (different from the hike to the farm). The .8-mile trek is perfect for kids, with cheerful placards about owls, bats, and salamanders. Still, a certain solemnity fell over us as the dense vegetation choked out any sound from the park. A warning sign about bears made me regret our picnic of peanut-butter sandwiches and how laxly I’d wiped the kids’ fingers after. A wide creek ambles through this gem near Lake Hartwell. Cars can ford it, and kids can slide on its rocks—or splash in the swimming pool, one of only three in Georgia state parks. There are no cottages, but covered platforms make camping a cozier affair. Bring your clubs if you want to tackle the hilly 18-hole golf course. This well-rounded Winder park suits kids of all ages. In addition to a 260-acre lake ensconced in the forest, there’s a 1792 fort built to defend settlers, a peninsula of yurts on the water’s edge, a wooded disc golf course, mountain bike trails, and a swimming beach. Twin lakes anchor this northwest Georgia getaway. Little legs will scamper across the boardwalk that spans the upper lake, perhaps stopping to feed the ducks. An easy hike takes you beneath a trickling waterfall into the mouth of an abandoned marble mine. Longer legs can explore the Pinhoti Trail, which covers some 337 miles across Alabama and Georgia. 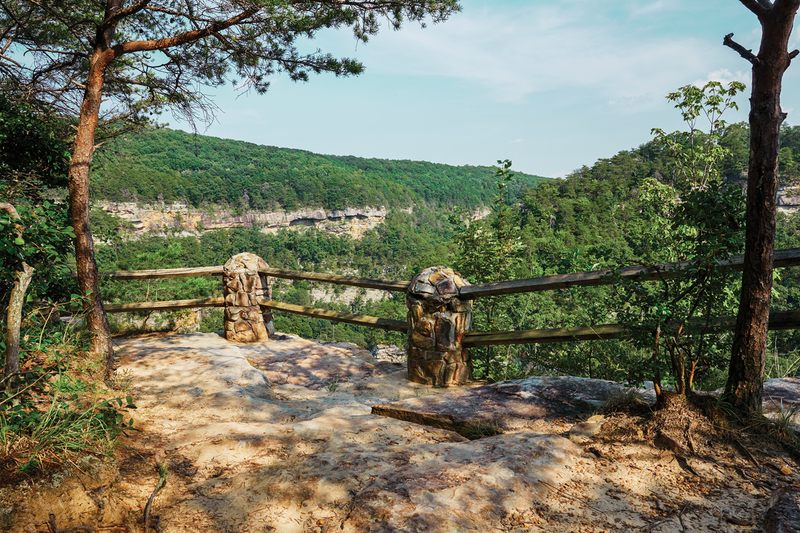 It’s possible—if you can enlist enough families and plan far enough in advance—to book every last one of the 10 yurts that sit just off an access road near the western entrance to Cloudland Canyon. Monopolizing this cozy compound has tactical advantages, like free rein over the communal picnic pavilion and playground around which the yurts orbit. It also means the grownups could stay up late and plug in their music, knowing you won’t be disturbing anyone. Well, maybe your sleeping kids. But whatever. 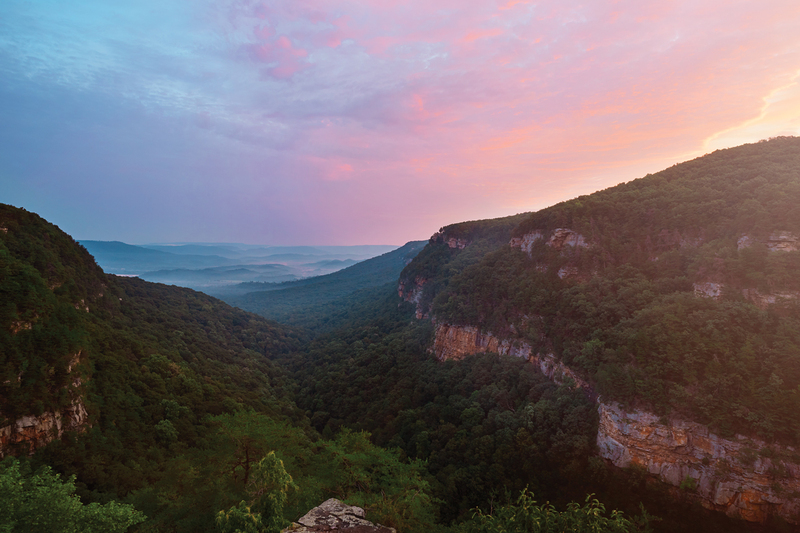 The first yurts in Georgia’s state park system arrived in 1996, but Cloudland Canyon’s yurt village is not even six years old. Constructed of wood and sheathed in canvas—with a portable heater inside and a ceiling fan high above—the yurts are impeccably maintained. Each features a charcoal grill out front and a deck out back. Ours slept our family of four comfortably, and the first thing we did when we arrived the last weekend of April was unroll the window flaps to let in the mountain air. At 2,000 feet above sea level, and far from the smog of Atlanta, just a few deep breaths is enough to cue your body that it’s time to unwind. This 1,000-foot canyon looks as glorious from above as below. Choose your challenge (or lack thereof): steep stairs and a suspension bridge, or flat rim trails. Easier still? Leaf-watching from the porch of Tallulah Point Overlook, a country store just off Highway 441. In 1970, Karl Wallenda famously crossed the gorge on a tightrope. A few miles north of Clayton and 3,640 feet above sea level sits Georgia’s highest state park. 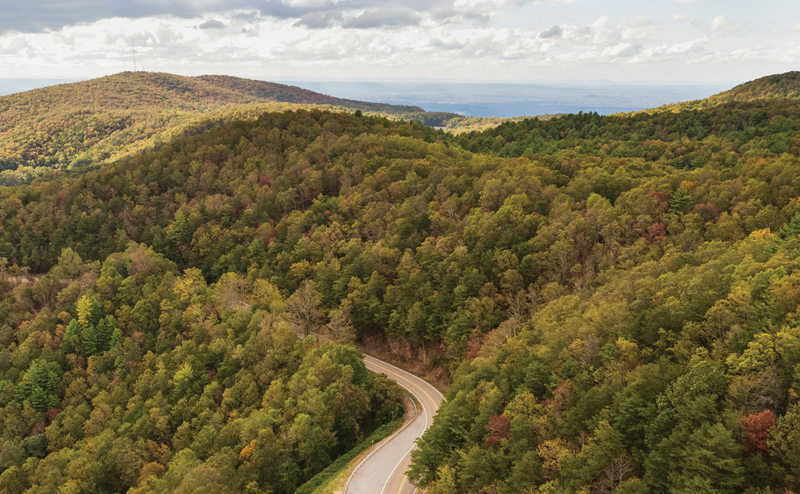 The winding drive to the visitor center is an excursion in itself, with roadside overlooks showcasing Blue Ridge vistas. 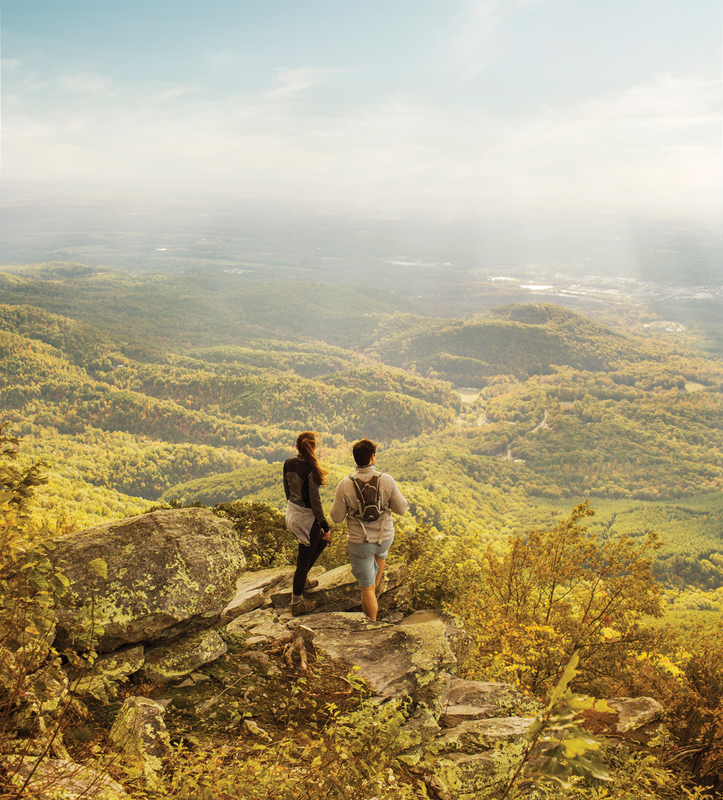 Hike the 2.2-mile Tennessee Rock Trail and peep into South Carolina, North Carolina, and Tennessee on a clear day. Atop this granite monadnock in Stockbridge, spy Atlanta’s most famous rock, Stone Mountain, as well as the distant city skyline. The summit is accessible only on ranger-led hikes, offered most weekends in the morning or at sunset, to spare the outcrop’s delicate mosses, lichens, and crimson diamorpha. 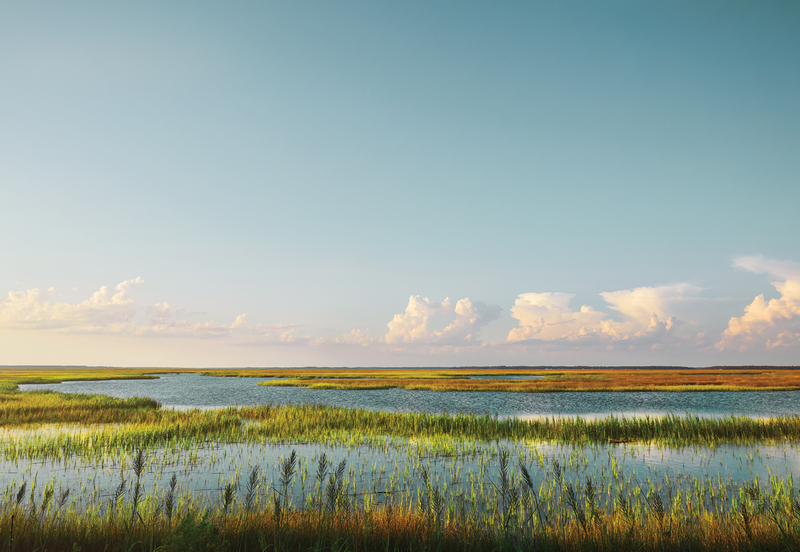 For many Georgians, our coast is something of a mystery, while the beaches of the barrier islands—St. Simons, Cumberland, Jekyll—get all the hype. Fort McAllister State Park, tucked in a curve of the Ogeechee River 20 miles south of Savannah, is practically undiscovered. 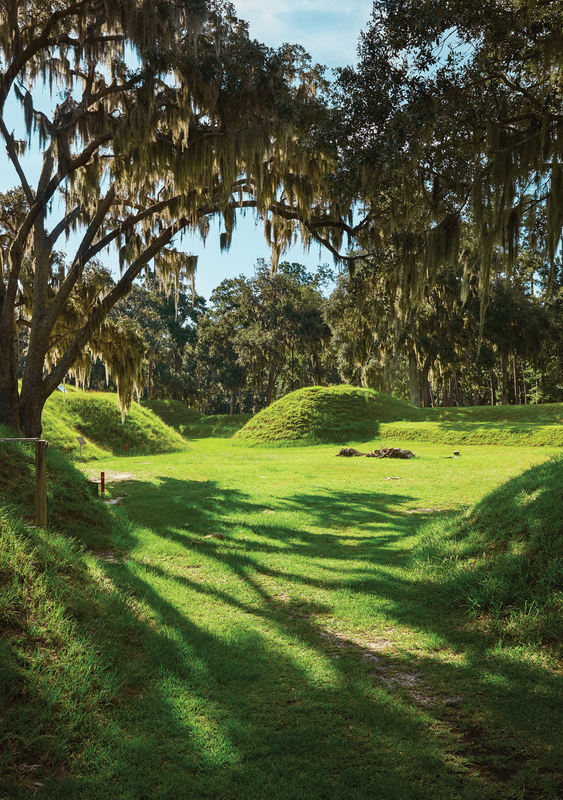 The old Civil War fort, perched on a bluff above a shimmering salt marsh beneath a canopy of Southern pines, palms, and live oaks, draws history buffs and nature lovers alike. For a place so seemingly obscure, Fort McAllister holds a lot of distinctions. It marks the end of Sherman’s famed March to the Sea, a triumph that opened Savannah to the general and his troops. In the 1930s, Henry Ford (yes, that Henry Ford) purchased the property as part of an 85,000-acre winter estate. He experimented with growing rubber plants on the abandoned rice plantations and had such an impact on the area that the nearby town, Richmond Hill, was renamed for his estate. One of Ford’s chief legacies was restoring the 19th-century earthworks, with their high dirt berms, parapets, and bombproof tunnels that housed hot shot furnaces that hurled flaming cannonballs at Union ships. 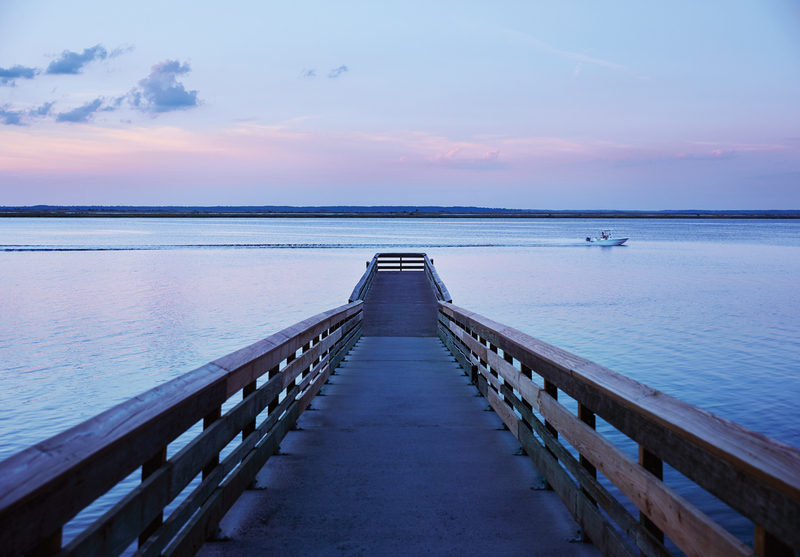 But even those with little interest in military history will find Fort McAllister alluring due to its dreamy coastal location, a prime spot for boating, paddling, and fishing. In fact, the location is actually home to two state properties: a park focused on nature and water recreation and a historic site featuring the battleground and accompanying museum. The public site includes a three-mile hike through the maritime forest and a well-equipped boat launch on the Ogeechee, but only overnight guests can pass through a gate to the discordantly named Savage Island. There, peaceful campsites dot the shady forest and seven tidy, two-bedroom cottages sit high on stilts overlooking the palmettos. (Go for a premier cabin for cushier, newer digs at a slightly higher price.) Throw a line in the brackish water and pull in a flounder, or drop a primitive trap off the dock and bring in a haul of blue crabs. 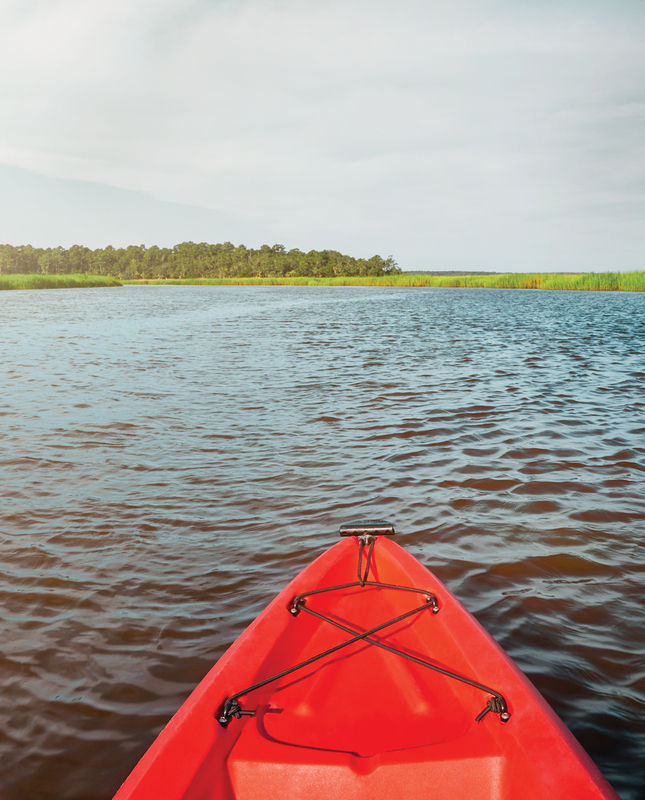 Paddle the Ogeechee or the tranquil Red Bird Creek in a canoe or kayak, available to rent. Ask a ranger about Sharktooth Island, a low-tide sandbar where you can picnic and hunt for marine fossils. Bring binoculars: A designated birdwatching destination by the Georgia Department of Natural Resources, Fort McAllister is a prime spot for spying painted buntings, ospreys, even bald eagles. Tugaloo juts into Lake Hartwell on a wooded peninsula and looks out on water in all directions. 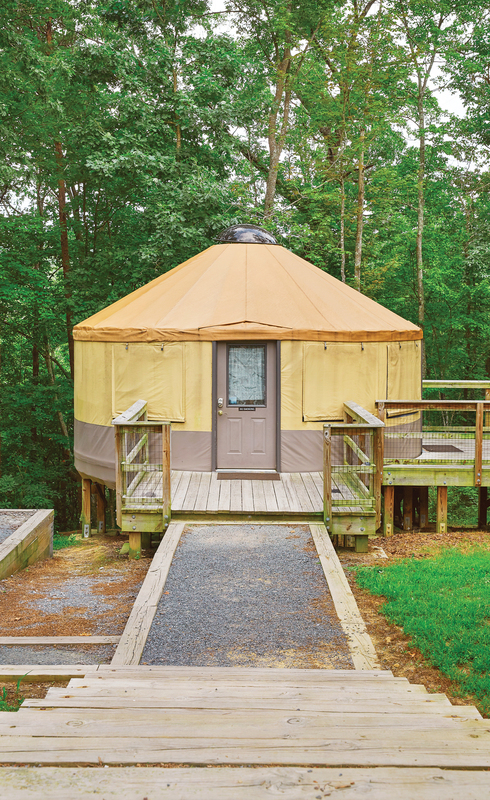 Stay in one of the prettiest yurt villages in a Georgia state park and enjoy boating, fishing (especially for large-mouth bass), playing tennis, and admiring the hardwoods on the Muscadine Trail. If you’re lucky enough to snag one of the six upscale cottages (courtesy of the property’s past life as a private retreat), you can fish trout-stocked Duke’s Creek any day. Otherwise, stay at nearby Unicoi State Park and book a fishing trip on Wednesday, Saturday, or Sunday (catch and release only). No reservation needed to hike the verdant, waterfall-dotted forest resurrected from Gold Rush–era desolation. On Lake Lanier’s northern tip, where the reservoir meets the Chattahoochee River, Georgia’s newest state park offers modern facilities and manicured grounds. Swim, rent kayaks and paddleboards, launch a boat, even prep your catch at a fish-cleaning station. It’s a great day trip, but lakeside cottages invite longer stays. Tackling the 301 trail is not for the faint of heart. Look out for bears. What goes up must come down. No one appreciates that expression—or its inverse—more than a mountain biker. And no Georgia mountain bike trail better illustrates it than the 301 at Fort Mountain State Park, a punishing 14.6-mile loop. On a recent rainy Saturday, Gary Wright pulled into the trailhead parking lot at the Chatsworth park. His was the only car. The 40-year-old Lawrenceville resident bikes multiple times a week, often with the Zombie Camels Mountain Bike Club, the social club he cofounded. But he’d never ridden Fort Mountain. Undeterred by the solitude and weather, he plunged in. The trail isn’t hand-built “singletrack” (the type of narrow, winding dirt path favored by today’s mountain bikers) but rocky, old-school service roads. Wright spent the first few miles happily cruising downhill. He started a brief ascent that brought him to a ribbon of clear-cut land around a power line. He assumed he’d cross it but, with a flip of his stomach, realized the trail streaked down the mountain alongside the power line. For a mile. “I was booking, and it was wet, and I got a little scared,” he admits. He had the good sense to walk a bit. The next few miles brought respite: dense woods with tripping creeks and waterfalls, a red-tailed hawk flashing a four-foot wingspan. Around mile 10, the trail started climbing—and climbing, an unrelenting three-and-a-half-mile slog to the end. An exhausted Wright was on the home stretch—the gnarly switchbacks had eased up—when he turned into the path of a black bear and her cub. The frightened cub scampered up a tree. Its mama fled 100 yards into the forest, then turned back and watched him. He contemplated snapping a picture. His instinct for self-preservation said to keep pedaling. Fort Mountain has all the recreation, scenery, and history one can hope for in a state park. Besides mountain bikers, its 75-plus miles of trails draw horseback riders (you must BYOH), “ultrarunners” competing in grueling endurance races, and hikers. 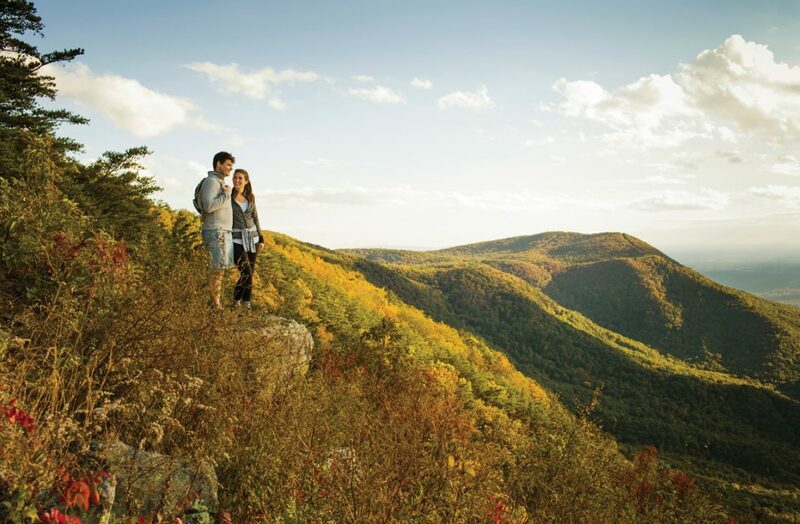 The most popular hike is 1.2 miles and includes three memorable features: an overlook with a panorama of Blue Ridge peaks and idyllic countryside; a 1930s fire tower built by the Civilian Conservation Corps, restored in 2015 and sometimes open for touring; and the serpentine rubble of a mysterious stone wall that dates back, it is thought, to 500 AD. The rocky terrain makes for good bear dens. According to assistant park manager Elliot Murrer, “One black bear is pretty noticeable because she has a paw that she doesn’t put any weight on, and she actually continues to have cubs despite that. There’s one with a white ‘V’ on his chest, a bear with one ear,” he says. Regular sightings are reported between June and October. Accommodations include 80-plus campsites and 15 spacious, renovated cottages. One cottage backs up to a small lake, the rest to thick and sometimes steeply plunging forest, where you might spy the hazy blue of opposing mountains between trees. Sink into a back-porch rocking chair, and rest your weary legs. Hiking is the game at Georgia’s largest state park. 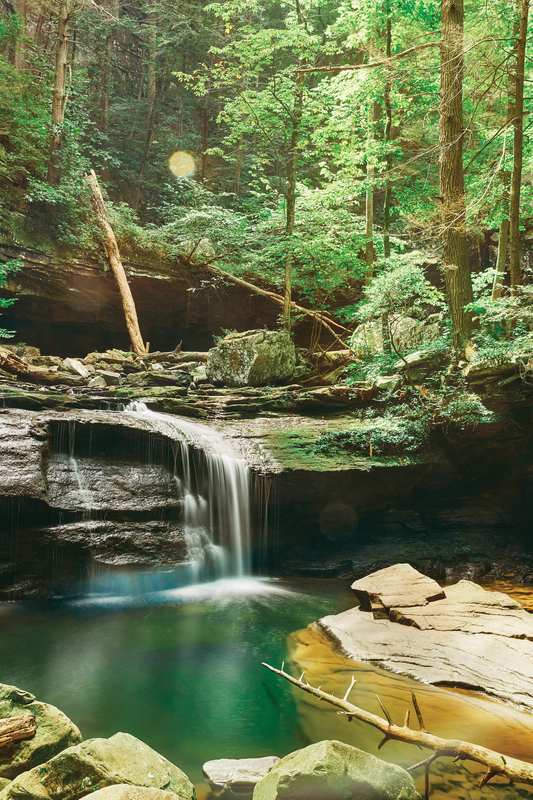 The 23-mile Pine Mountain Trail, maintained by a dedicated nonprofit, contains 16 backcountry campsites in a rocky forest filled with streams and waterfalls. Atop Dowdell’s Knob, a statue of Franklin D. Roosevelt looks out over miles of treetops, as the real president did from the same spot. To explore the park by horseback, Roosevelt Riding Stables offers guided rides. Here’s an adventure: Book a guided nighttime paddle through Georgia’s first gold-tier International Dark Sky Park, which happens to be in the Okefenokee Swamp. Study the Milky Way, and try not to dwell on what lies beneath you in this refuge of the American Alligator—and wood storks, black bears, indigo snakes, pitcher plants, and cypress. Proximity to Helen and general mountain splendor have long made Unicoi a favorite. Privately managed since 2013, it now offers zip lines, including the half-mile “Screaming Eagle” run over the lake; an archery and air rifle range; and a spruced-up, 100-room lodge (but also fun are the recently renovated ’70s-style, barrel-shaped cabins).